Lets talk about suckers. We all remember the giant swirly lollipops from our youth, along with Dum-Dum's and Safe T Pops too. So how about some grown up suckers for the sophisticated gourmet palate? That brings us to DAS. Whether it be bacon, pomegranate, ginger or caramel, DAS has a sucker for you. Bacon lovers unite-finally, you can have your dessert that also conains your favorite food group- Bacon! 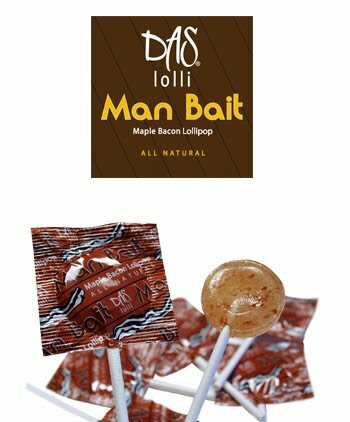 This maple and bacon lolli is a fiercely delicious combination of real smoky bacon bits and delicious maple syrup giving all at once savory and sweet sensation. Mmm- Bacon! hy is the delicious Ginger pop Naughty? That is because it is sweet, tangy and tantalizingly spicy all at once! Small bits of candied ginger are complemented by lemon that tickles the mouth and can help soothe an upset stomach. This is an all time favorite of moms to be! Tangy Lemon and bits of Ginger - additively spicy! 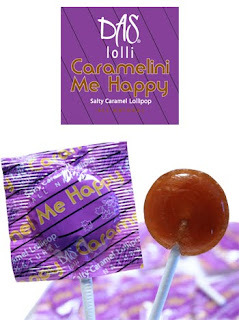 A caramel and lavender lolli made with caramelized cane sugar and indulgent chewy Das Caramelini Salted caramel mixed with real lavender extract and tiny crystals of Fleur De Sel sea salt for a trendy, delicious sweet and salty treat. 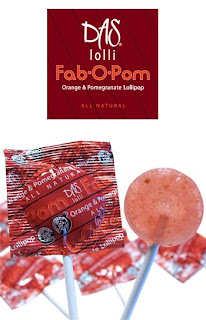 Our Fab-O-Pom lollipop is truly fabulous- a pomegranate and orange lolli that tastes good and good for you. 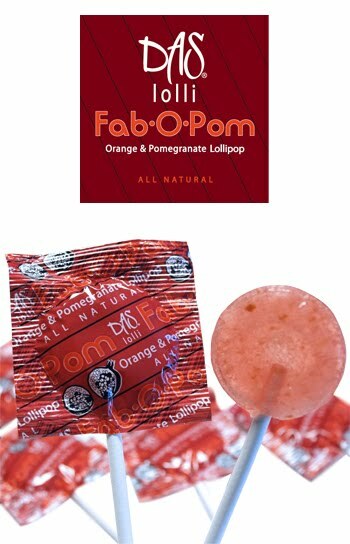 It's a sweet and tangy fusion of heart-healthy real pomegranate extract and fragrant orange oil with tiny pieces of orange zest. With these four gourmet suckers to choose from how can you go wrong? Each of these retail for $0.75/ea and are in our Downtown Carrollton location now!